Published today in the journal Cell, the research shows that an enzyme called UBE3A can be switched off when a phosphate molecule is tacked onto UBE3A. In neurons and during normal brain development, this switch can be turned off and on, leading to tight regulation of UBE3A. But a research team led by Mark Zylka, PhD, associate professor of cell biology and physiology, found that an autism-linked mutation destroys this regulatory switch. Destruction of the switch creates an enzyme that cannot be turned off. As a result, UBE3A becomes hyperactive and drives abnormal brain development and autism. 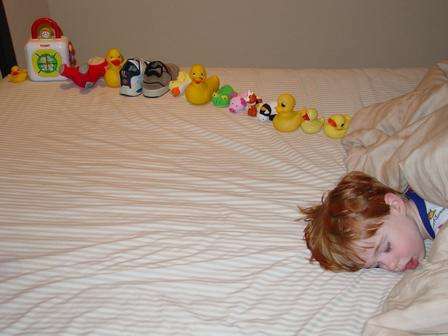 "Genetic studies are showing that there will be about 1,000 genes linked to autism. This means you could mutate any one of them and get the disorder. We found how one of these mutations works," said Zylka, senior author of the Cell paper and member of the UNC Neuroscience Center. The work was done in human cell lines, as well as mouse models. Because this one autism-linked UBE3A mutation was part of the Simons Simplex Collection - and Zylka previously had been funded through a Simons Foundation grant - he had access to the cells that were used to find this one mutation. When Jason Yi, PhD, a postdoctoral fellow in Zylka's lab, sequenced the genes from the cell samples - including cells from the child's parents - he found that the parents had no hyperactive UBE3A but the child did. The child's regulatory switch was broken, causing UBE3A to be perpetually switched on. "When this child's mutation was introduced into an animal model, we saw all these dendritic spines form on the neurons," said, Zylka, who is also a member of the Carolina Institute for Developmental Disabilities. "We thought this was a big deal because too many dendritic spines have been linked to autism." Their findings thus pointed to hyperactivation of UBE3A as the likely cause of this child's autism. It was previously thought that too much UBE3A might cause autism because duplication of the 15q chromosome region - which encompasses UBE3A and several other genes - is one of the most commonly seen genetic alterations in people with autism. This is called Dup15q Syndrome. As part of their study, Zylka and Yi found that protein kinase A (PKA) is the enzyme that tacks the phosphate group onto UBE3A. This finding has therapeutic implications, particularly since drugs exist to control PKA. "We think it may be possible to tamp down UBE3A in Dup15q patients to restore normal levels of enzyme activity in the brain," Zylka said. "In fact, we tested known compounds and showed that two of them substantially reduced UBE3A activity in neurons." One of the drugs, rolipram, previously had been tested in clinical trials to treat depression but was discontinued due to side effects. One of the symptoms associated with Dup15q syndrome is sudden unexpected death in epilepsy. In light of these life-threatening seizures, Zylka pointed out that it may be worth examining whether lower doses of rolipram, or other drugs that increase PKA activity, provide some symptom relief in Dup15q individuals. "The benefits might outweigh the risks," he said. Future work with an animal model of Dup15q could be used to test this therapeutic approach. While the bulk of this project was focused on autism, this project began when Zylka and Yi noticed that a large number of Angelman syndrome-linked mutations were clustered in the same chromosome region where the phosphate group was tacked onto UBE3A. Angelman syndrome is a rare neurological disorder characterized by developmental delay, seizures, balance problems, and lack of speech. Zylka's team found that a number of the Angelman mutations disrupt the function or stability of UBE3A. These mutations would essentially eliminate the enzyme in people with Angelman syndrome. This discovery could have implications for diagnosing people with this rare and often misdiagnosed disorder. Re: "...an enzyme called UBE3A can be switched off when a phosphate molecule is tacked onto UBE3A." How can we address the fact that an RNA-mediated amino acid substitution must be prevented from stabilizing the organized genomes of these individuals? If we can't, who is going to link virus-perturbed protein folding to the mutation? Wait, no, vaccines cause autism! Those idiots couldn't be wrong about that, could they? Some vaccines contain attenuated viruses. Don't they? Since the role of viruses in cell type differentiation in species from microbes to man was not considered when the "Modern Syntheses" was invented by population geneticists, it may be too soon to claim that the anti-vaxers are idiots. Besides, the CRISPR-Cas9 technology uses viruses for gene editing almost as successfully as virus-driven gene editing normally occurs to link ecological variation to ecological adaptations in all genera via their nutrient-dependent RNA-mediated protein folding chemistry that biophysically constrains the viruses.